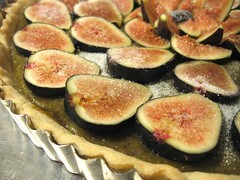 Fresh Fig and Pistachio Frangipane Tart - Do You Know The Muffin Man? Notes: I used a full 5 tbsp. of water in the pâte brisée which made it easier to roll out, but resulted in a cracker-like crust. 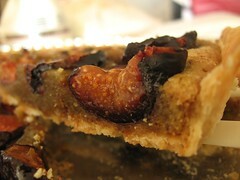 The frangipane was very strongly flavoured (of peanuts!) and was a deep green-brown in colour. It's hard to tell if a fig is ripe, but after baking in the oven for so long, they all become quite soft. High marks from all the tasters for an interesting combination. 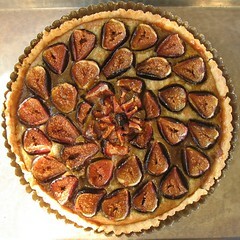 The figs aren't quite to my taste, but I would certainly make this again with other fruit.